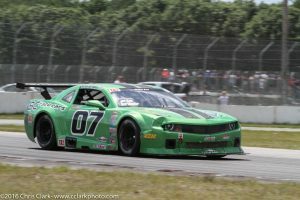 BCR had two cars running at Brainerd International Raceway, MN in the SCCA Trans-Am series; first, Jordan Bernloehr in our familiar TA2 #07 Green Machine, sponsored by Millers Oils/Pro Kart, Air Jacks, and Quality Contour. The second car is the first TA car that was ever built by us in 2003 and now owned by BIR track Owner Jed Copham. As the car has not been raced for many years, the crew had to spring to action to correct faulty brakes, an engine oil pick-up problem and a transmission overheating issue, just to name a few. We finally got most of it right by qualifying, and Jed used his track knowledge to secure 7th place in only 3 laps. He was also super quick in final practise, 3rd, with a full fuel load and used tires. The race did not go so well, a few spins and offs, but he battled his way back till a broken header ended his day on lap 28. Jordan’s weekend also started and ended on a difficult note, with lots of highs in between. The first practise tore off the nose/splitter of the car, but the BCR crew had him back on track without missing a session. We kept improving the car, but Jordan was not able to qualify well due to a broken front anti roll bar link, which snapped. Starting 11th and held up by a poor starter ahead of him, he literally had to work his way up the field from dead last. That he did, and found himself battling in the top 6-8 cars for the lead, all separated by under a second. Unfortunately, with 5 laps to go, a fight for the lead led to a car spinning, and Jordan had nowhere to go, T-boning the car and sustaining heavy damage to the #07. The exciting part was Jordan’s legitimate speed, he was easily keeping up to the lead group and reporting to have a better car. Finding the speed is always the most difficult challenge for a race team and driver, now we need a bit of luck! 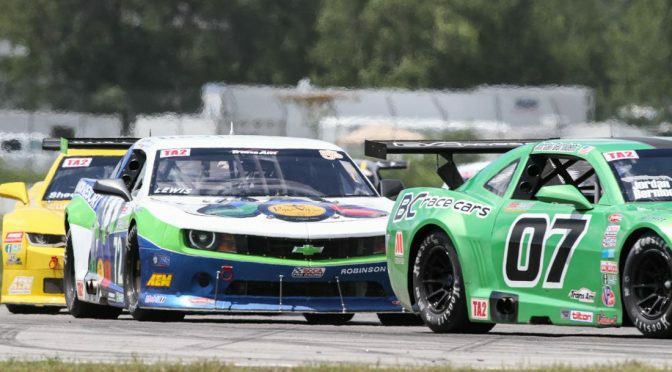 We are stoked about the next race at Mid-Ohio where Jordan has driven before and he will be joined by Harry Steenbakkers and Mike McGahern in the BCR #78 and #48 respectively! 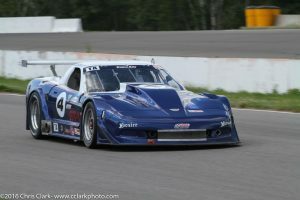 Click below to watch a few race laps with Jordan Bernloehr in BC RACE CARS 07 TA2 race car.